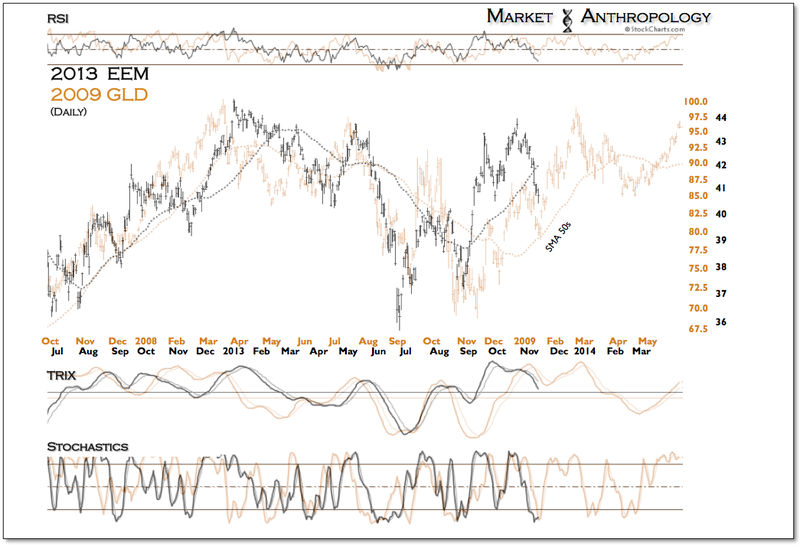 Going into 2013 we had expected a continuation of the bear market in commodities that began in the second quarter of 2011. To help guide us along the way we have contrasted the previous bear that roiled the sector in 2008 and 2009, to give us greater insight into this cycles duration and kinetic potential across asset classes. To a large degree our attention has been focused on the intermarket relationships that have driven the commodity sector - and the throw-off effects to various equities that are derived from these assets. 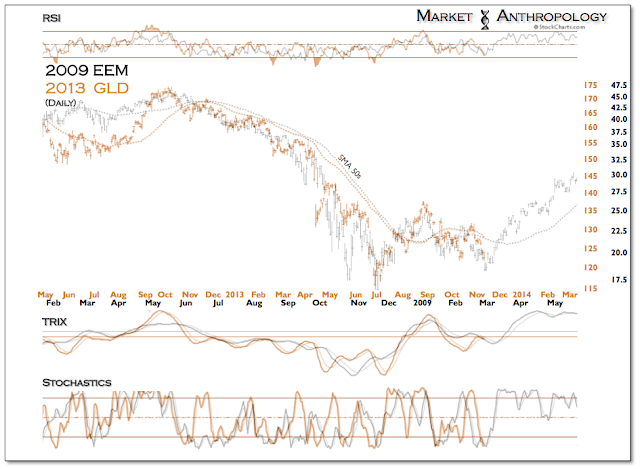 A notable contrast with the 2008/2009 bear and one that we have needed to shift our expectations with, is that the equity markets that are predominantly derived from the commodity sector (EEM) appear to be leading the commodity markets themselves today. 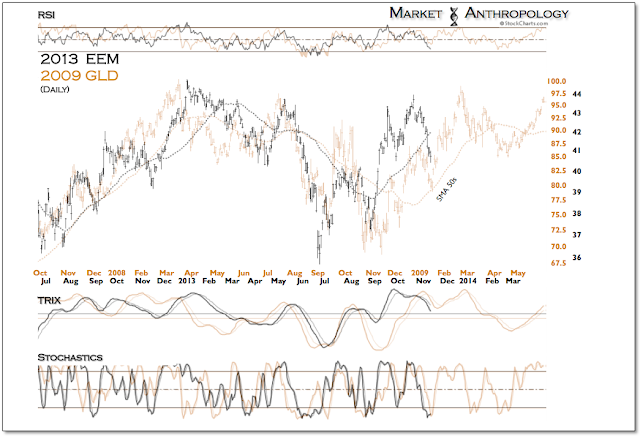 That is, the greatest elasticity in momentum coming out of the cycle low has been sustained in equities - such as EEM, while commodities themselves have largely consolidated near last summer's lows. As the comparative series shows below - it has basically been the inverse of the 2008 and 2009 market. 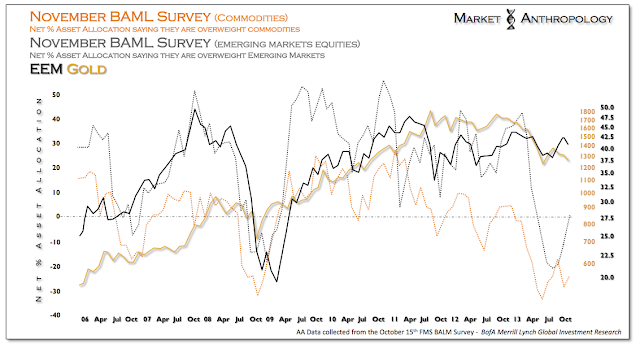 The November Bank of America Merrill Lynch (BAML) global fund manager survey was out yesterday and showed the needle starting to move higher away from all-time lows for asset allocations by managers in both EM equities and commodities. As mentioned last week, the takeaway for us from the BAML survey is that despite sentiment and positioning exceeding the panic and crisis lows from 2008, from a long-term perspective both sectors look compelling - assuming worldwide growth shows up again next year. We still believe it will.